Cook spaghetti according to instructions in salted water. When pasta is almost done cooking, reserve 2 cups of cooking water for later. In a large high-walled skillet over low heat, add olive oil, butter and coarse black pepper, heating until butter is melted. Add about 1/2 cup reserved pasta water to the skillet and swirl to combine. Add cooked pasta directly from cooking water, using tongs to toss together the noodles and butter-oil mixture. 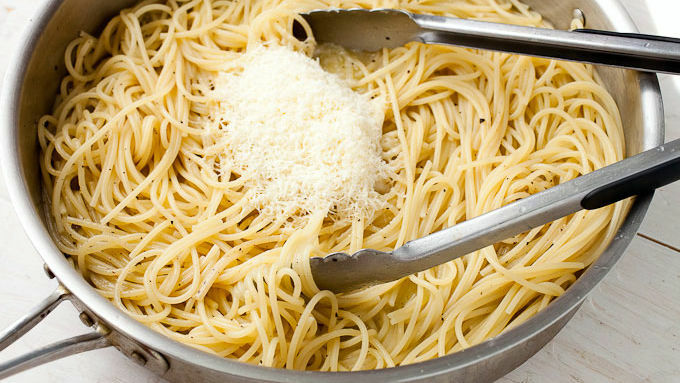 Add Parmesan cheese to the pasta, along with enough reserved pasta water to make a light sauce that coats the spaghetti. Start by adding 1/2 cup water and gradually add more (up to 1 cup total). Continue to toss the pasta together with the sauce until the sauce lightly coats the spaghetti. Serve immediately. Garnish pasta with red pepper flakes, extra Parmesan cheese and fresh basil. When cooking pasta, add 2 tablespoons kosher salt for every gallon of water. You can eyeball it. If you have a two-quart pot for your pasta, add a big, four finger pinch of kosher salt and you should be good to go. One of the most classic true Italian pastas has the fewest and easiest ingredients. Go figure, right? 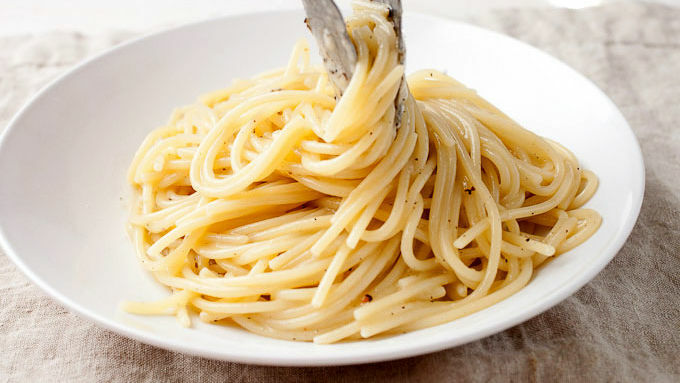 “Cacio e pepe” means “cheese and pepper”—talk about simple. It has become my go-to for a fast weeknight pasta dish when I don’t feel like opening a jar of sauce or whipping up a quick tomato sauce. The trick to it is to use an often-overlooked ingredient: The pasta cooking water! Follow along and this recipe can be mastered in minutes. While you could theoretically make this recipe with any pasta, I suggest spaghetti. Don’t use the thin spaghetti though. It’ll be too flimsy. The first important ingredient in this recipe the “pepe” in the name. Lots of black pepper goes into this sauce and it’s really best if you start with whole peppercorns and crush them yourself. Start the sauce by adding some oil, butter, and coarsely crushed black pepper to a large skillet with high walls. Ultimately all your pasta is going into this skillet so it needs to be big. Cook the pasta as you normally would. Don’t forget to salt the cooking water. I usually use a big four-finger pinch of kosher salt for my water. This cooking water becomes really starchy after the pasta cooks in it. It’ll make any sauce silky smooth. Anytime I cook pasta, I’ll scoop off a few cups of it to use for a sauce. Once your pepper has cooked over low heat with the butter and oil (be sure not to burn the butter) for a few minutes, scoop in all the pasta. Then add the Parmesan cheese. A cup is about right, but you could use more. Finishing the pasta is a trial and error situation. Add a little reserved pasta water to it and use tongs to toss the pasta together with the light sauce. Keep doing this in small amounts until the sauce just barely sticks to the spaghetti. You might use anywhere from 1-2 cups of pasta water to get the right sauce consistency. This was my finished skillet of deliciousness! 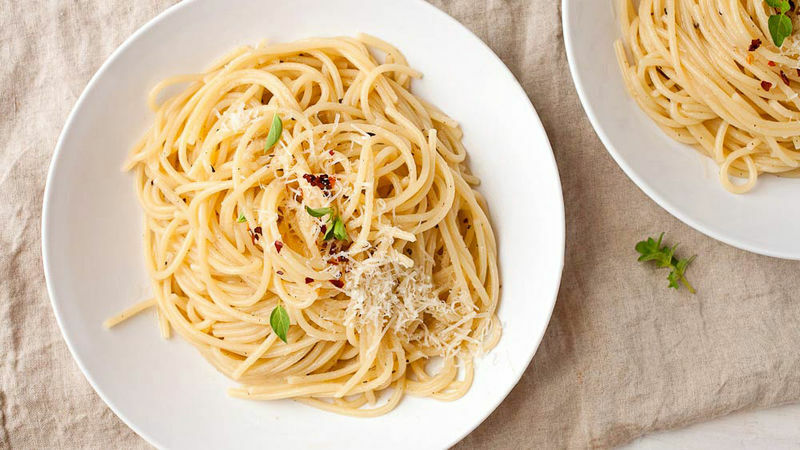 Divide this lovely pasta between plates and garnish with a little crushed red pepper, fresh basil and extra parm. It’s about as easy as good, classic Italian can get!